Last week, the Stony Brook University in New York hosted a one-day symposium at the Turkana Basin Institute entitled Hobbits in a Haystack: Homo floresiensis and human evolution. In this edition of rojak, we’ll be focusing on some of the buzz from the symposium. I’d like to start off by introducing Raymond Ho, a Bioanthropology Major at CUNY – Queens College who blogs about the Hobbit symposium sessions here (list of sessions) and here (Dean Falk’s talk on the Hobbit’s brain). Raymond also come from Malaysia – Ipoh to be exact! Check out some pictures of the Hobbit’s skeleton in Mamoritai’s photostream. 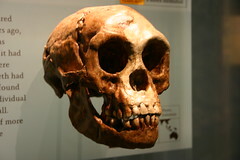 The New York Times writes that the emerging consensus among the experts is that homo floresiensis is indeed a new species.